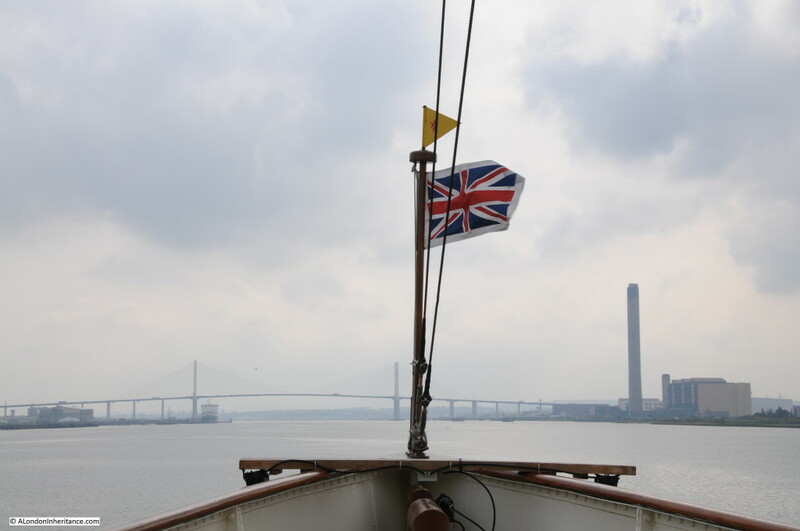 Before returning to London, a quick chance to explore the Thames Estuary and discover some of the legacy from the last war that has survived the last 70 years. As the Waverley left Southend, the sky and sea seemed to merge even more into a uniform grey with only the occasional boat adding any colour. 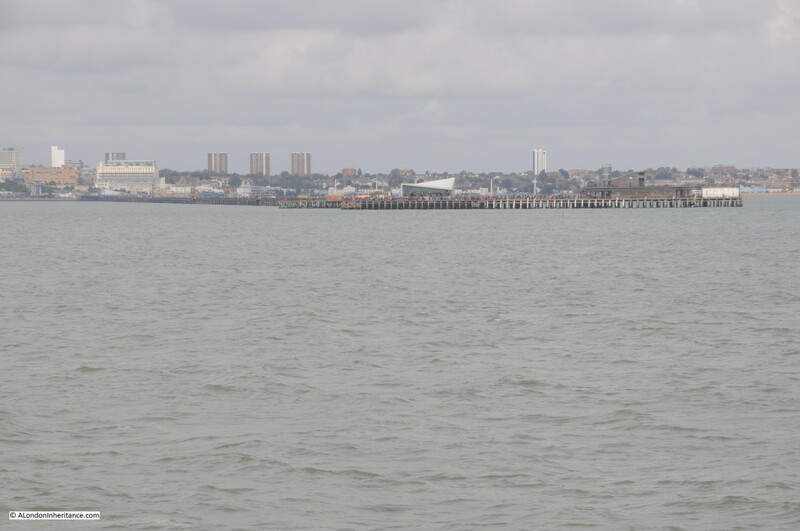 Soon after leaving Southend Pier there is the wreck of a part of the Mulberry Harbours that were used directly after the D-Day landings in France to provide temporary harbours until one of the French ports could be taken. This particular part is a Phoenix Caisson. These were very large concrete hollow boxes that were used to provide the support to the harbour. They were manufactured at three locations in the UK including Tilbury on the Thames, however this Caisson was being brought from Immingham on the Humber to Southsea (Portsmouth on the south coast) ready for transport across the channel. 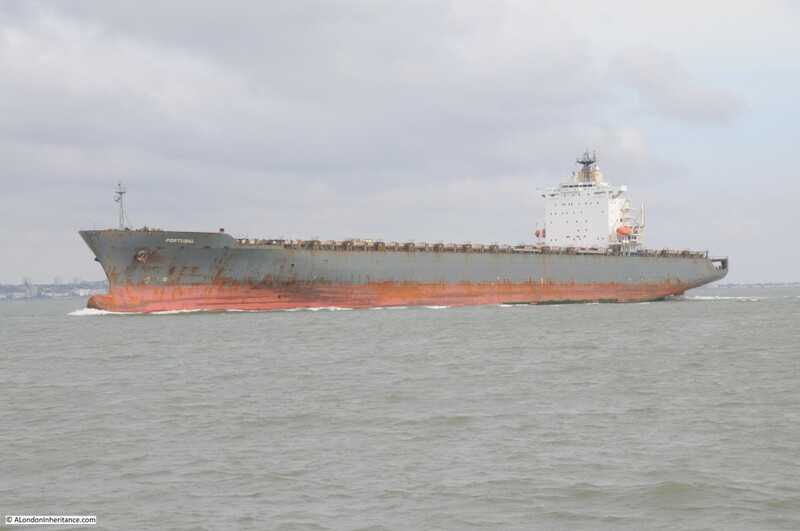 Whilst being transported from Immingham it sprang a leak and was towed into the Thames and beached in its current position. There is a much more potentially destructive relic of the last war about 5 miles from Southend. This is the wreck of the SS Richard Montgomery. The SS Montgomery left the US in August 1944 loaded with over 6,000 tonnes of munitions and explosives. Arriving off Southend the ship was instructed to moor off Sheerness. On the 20th August, the Montgomery started to drag her anchor and drifted to a sand bank where she became stuck as the tide went down and the due to the uneven distribution of weight and insufficient water to provide support, she broke her back and was stranded on the sandbank with her full compliment of explosive cargo. There was an attempt to remove some of the cargo, however before this was complete the ship finally broke in two and the salvage attempt was abandoned leaving a very considerable volume of munitions and explosives (high explosive bombs, fragmentation bombs, phosphorus bombs, pyrotechnic signals, flares and fuses) on the ship, which remain there to this day. The ship has an exclusion zone marked by buoys and is regularly surveyed to check the stability of the structure. I am not sure if anyone really knows what would happen if there was an explosion, many years ago I heard stories that it would break many of the windows in Southend. 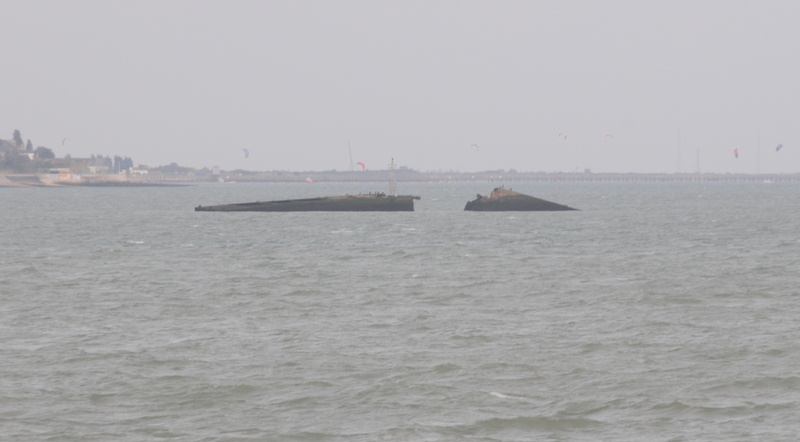 It is an eerie sight passing the wreck and seeing the masts of the SS Richard Montgomery still standing above the water. 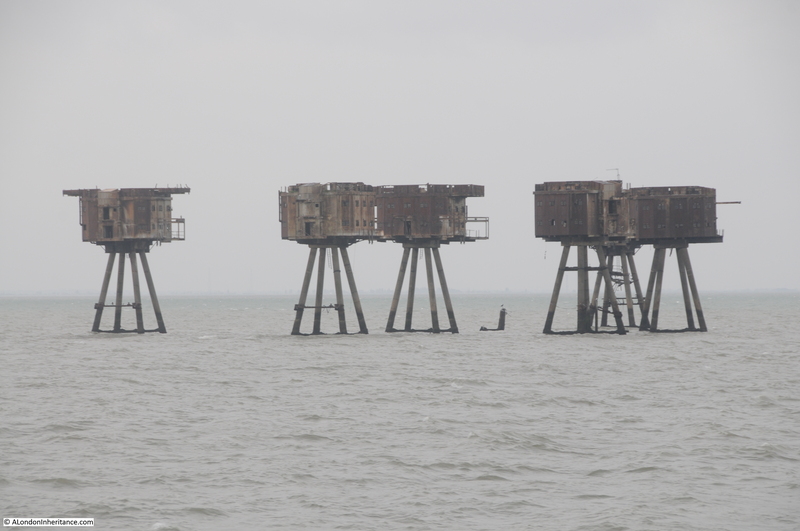 Further out from Southend are the Maunsell Forts. 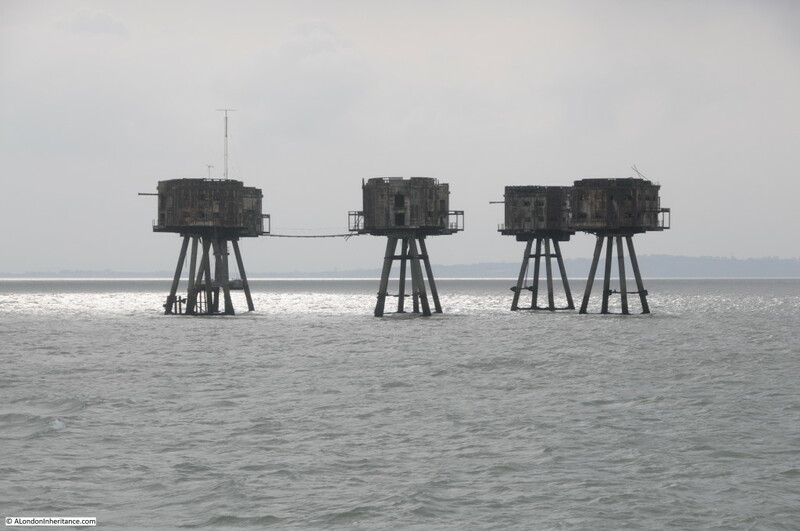 These were operated by the Navy and Army during the last war to provide anti-aircraft gun emplacements in the estuary. The River Thames provided an ideal navigation route to central London for enemy bombers. Even at night and with a blackout, the glint of the moon on the water of the Thames would lead directly to London. These forts were the idea of Guy Anson Maunsell, a highly innovative civil engineer who had worked on a range of civil engineering projects in the UK and abroad, including in 1931, the widening of Putney Bridge. The initial requirement was for a set of Naval Forts further out to sea than the Army forts. 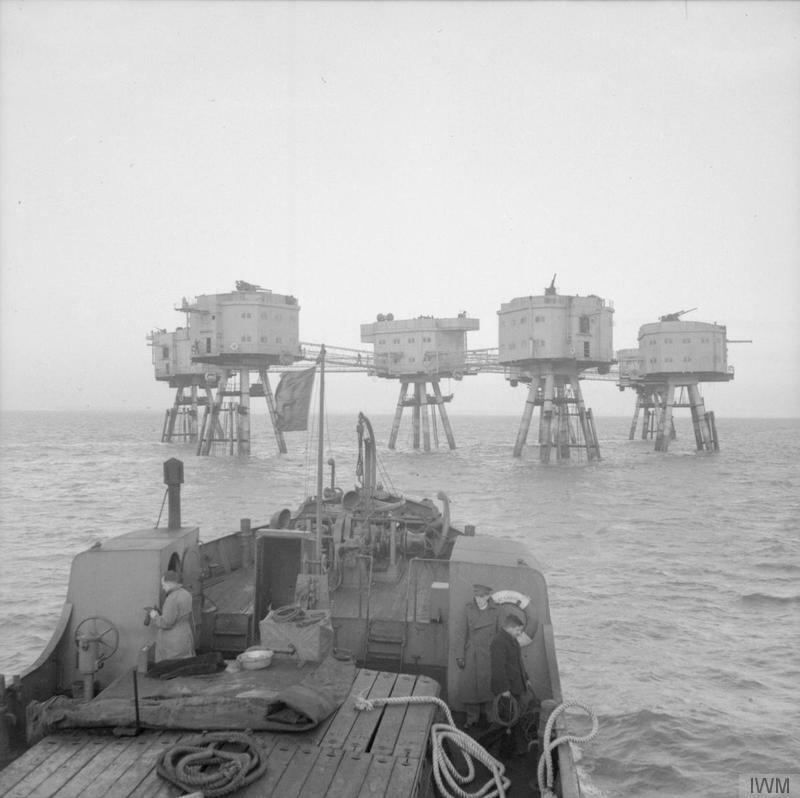 They were operated by the Navy with the objective of preventing German mine laying in the approaches to the Thames. Four of these were constructed, of which two (Rough Sands and Knock John) survive. 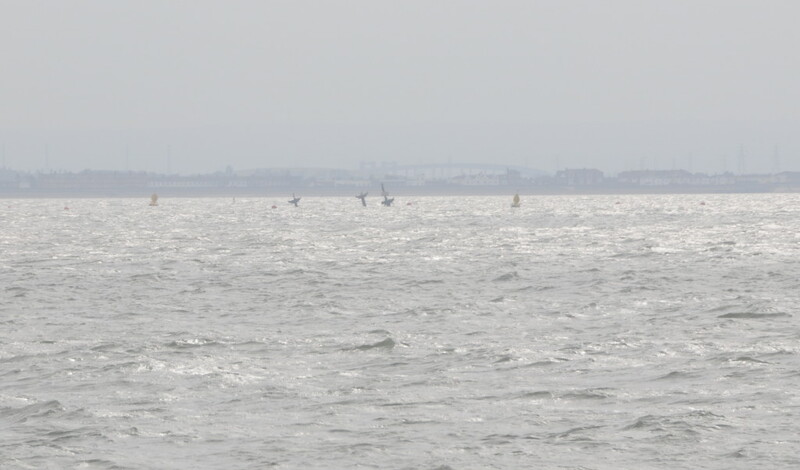 From the Thames Estuary the Knock John fort can be seen as a rather enigmatic shape in the distance. The Army forts followed the Naval forts. 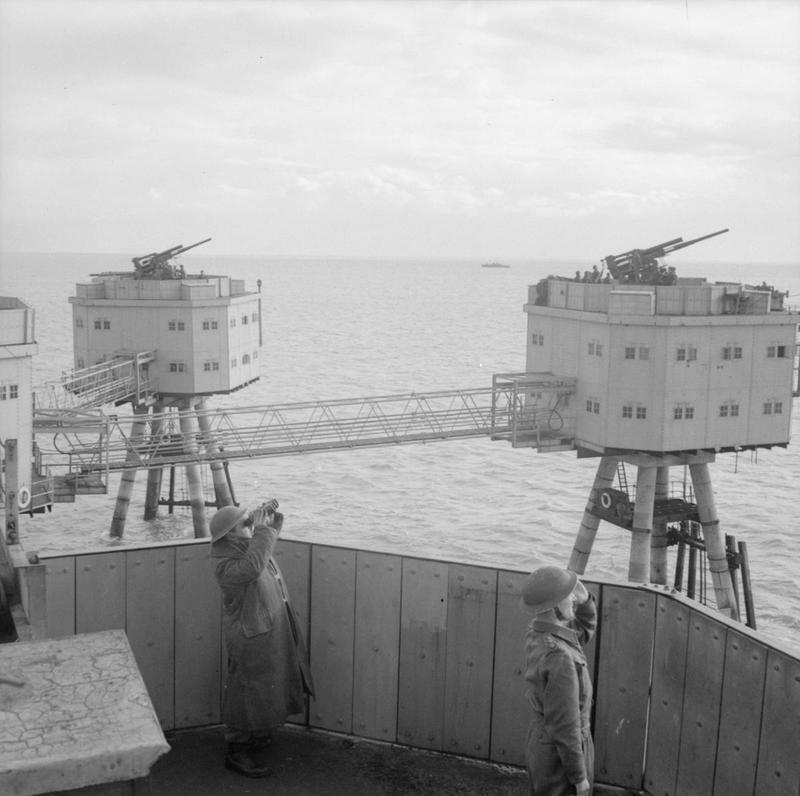 The aim of these forts was to attack approaching bomber forces with an anti-aircraft gun mounted on each of the individual forts. 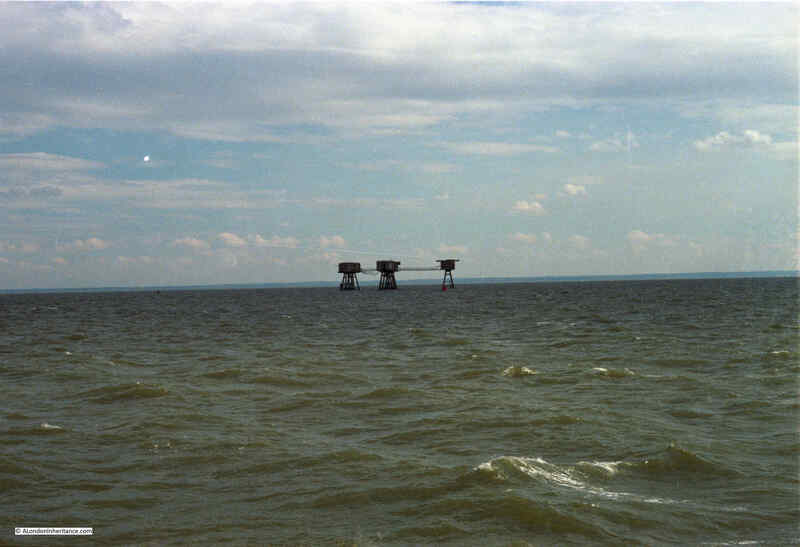 The first set of forts were deployed in the Mersey to protect Liverpool, with the next set of forts deployed across the Thames Estuary to protect London. Three forts were installed, Shivering Sands, Red Sands and Nore, with Shivering Sands and Red Sands remaining to this day. 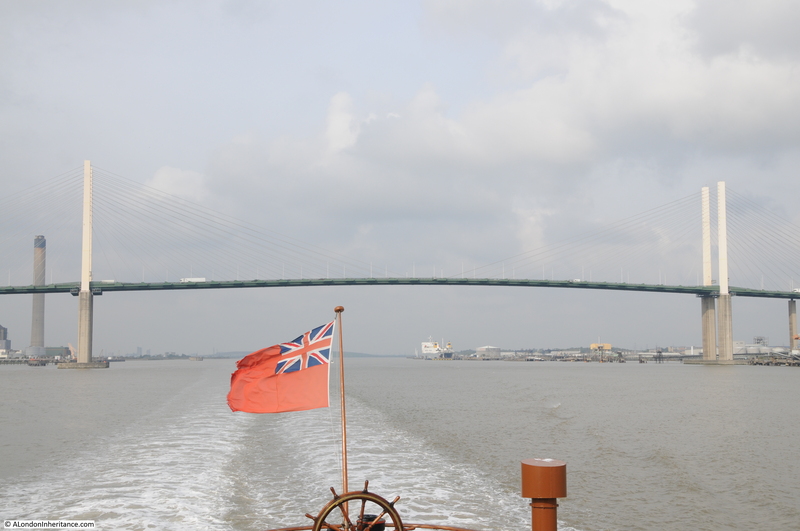 Setting out from Southend, the first fort is Red Sands. 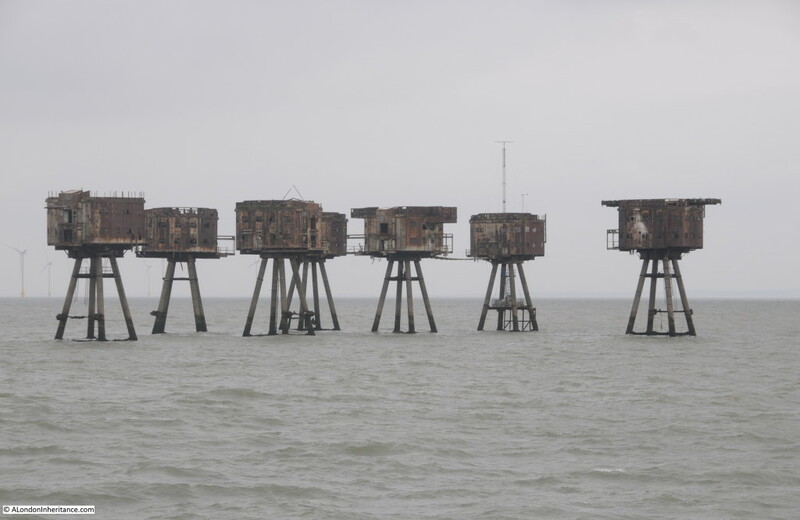 The forts were built on the Thames in a disused and derelict cement factory that Maunsell had found at Red Lion Wharf at Northfleet, close to Gravesend. 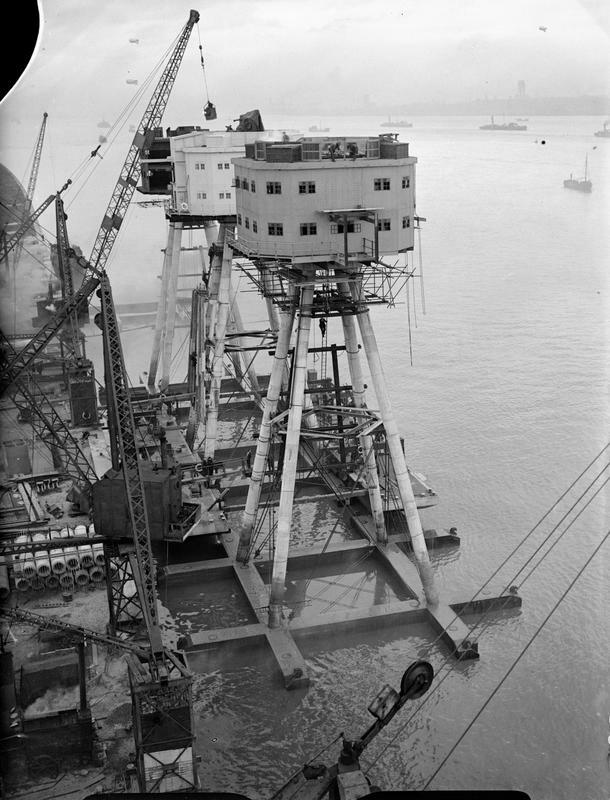 The forts were constructed, towed out and installed on site between May and December 1943. A central observation tower was surrounded by towers, each with an anti-aircraft gun installed. Walkways were run between the individual towers to provide access across the complex. Although land was visible from the forts, this must have felt like an isolated and remote location for those based on the forts, coupled with long periods where there would not have been any enemy activity. It cannot have been very comfortable on a cold and stormy winters night. The crew of the forts would spend 4 weeks on-board, then a 10 day break ashore. Although the forts were operational after the main period of the blitz on London they were successful during the later V1 campaign when at least 30 of the V1s were shot down on their way to London. I passed the forts during my 1978 journey down the Thames, with the following photo from this time. Most of the walkways were then still in place. The weather was also better, just to show that there is some colour in the estuary. The Thames Estuary provides an example of how power generation has changed over the last century. Initially, power stations were local to population centres. London had a number of smaller power stations, (my grandfather worked in one in Camden). These were replaced by larger stations such as Battersea and Bankside. 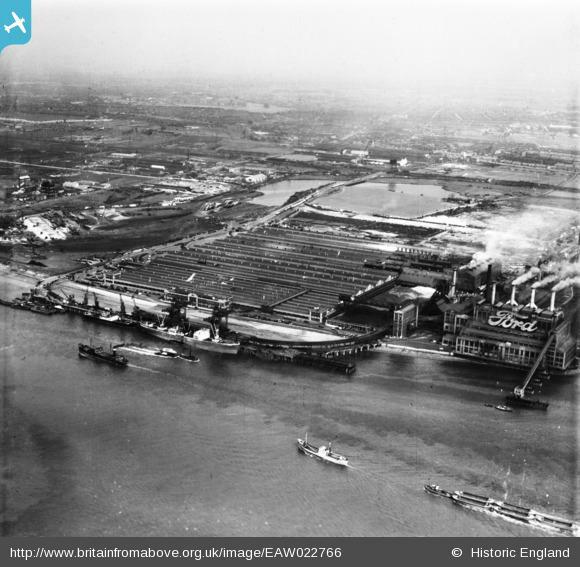 Power stations then started moving away from centres of population to places such as Littlebrook and Tilbury that we passed along the river. 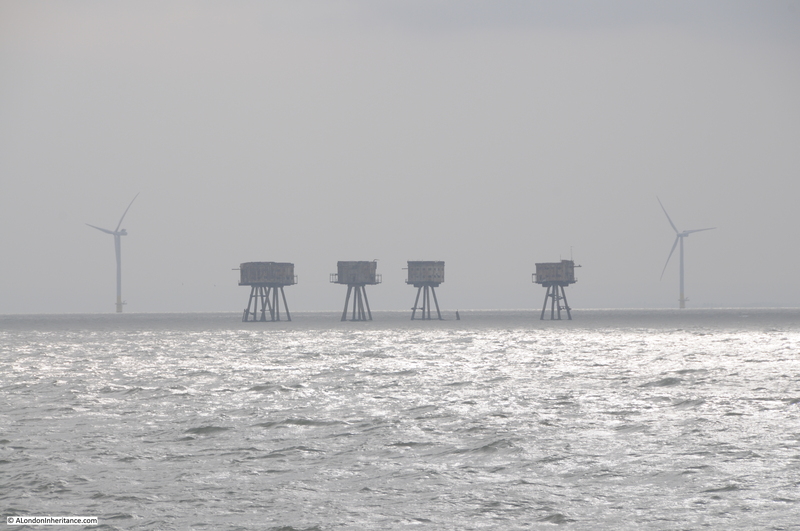 These have now closed and generation moved out to sea with a number of offshore wind farms located in the wider Thames Estuary. 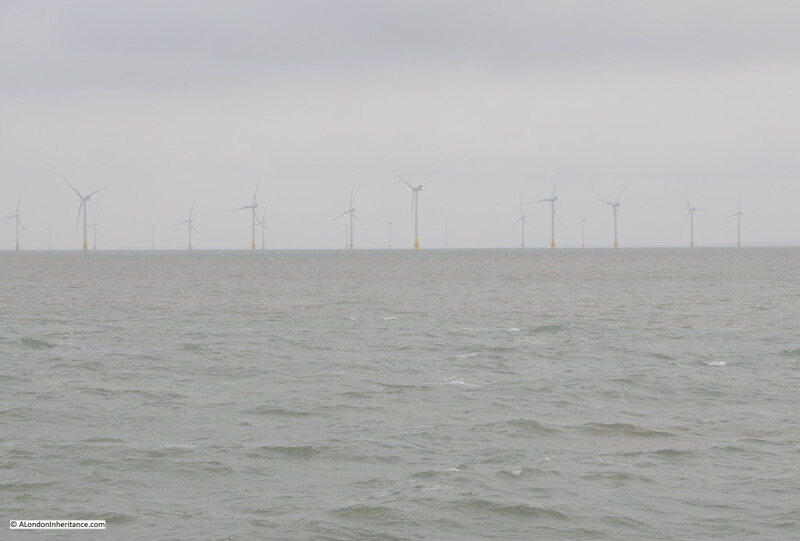 Emerging out of the gloom are the 30 wind turbines of the Kentish Flats Offshore Wind Farm. Passing Shivering Sands fort with Red Sands in the distance. Viewed from a distance they could almost be the Martians from H.G. 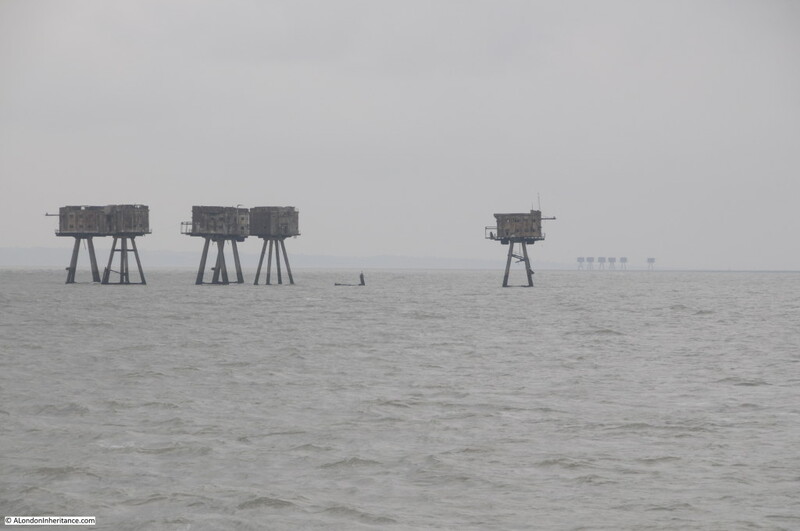 Wells book War of the Worlds, striding across the Thames Estuary ready to wreak havoc on Southend. Seventy years of construction in the Thames Estuary from wartime defences to peaceful electricity generation. After the war, Guy Maunsell and a couple of partners set-up their own business and were much in demand to work on major construction projects across the world. In London, G. Maunsell & Partners were responsible for the Hammersmith Flyover. When this was completed in 1961 it was the first such pre-cast segmented concrete structure in the UK. Further work followed on the Westway from Paddington to White City. Guy Maunsell died in 1961. His company continued independently, working on projects such as the Docklands Light Railway and the Jubilee Line, until the year 2000 when the company was bought by the US firm AECOM. 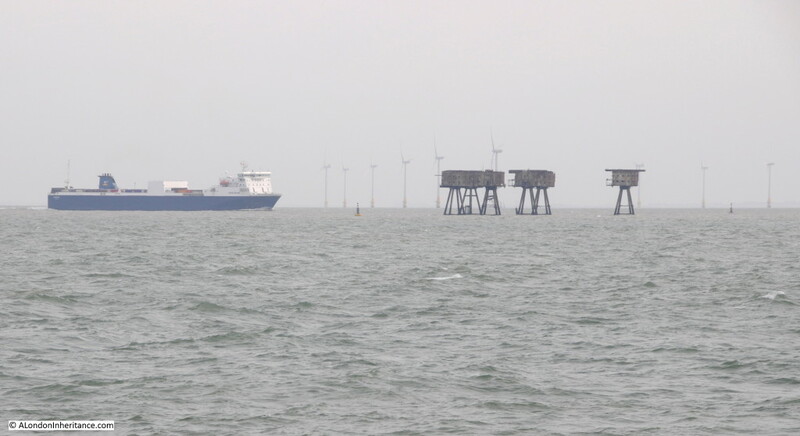 A final view of the Red Sands fort, wind farm and a ship approaching the Thames heading for its berth further upstream. The water that has flowed through London and down the Thames has now merged with the sea. 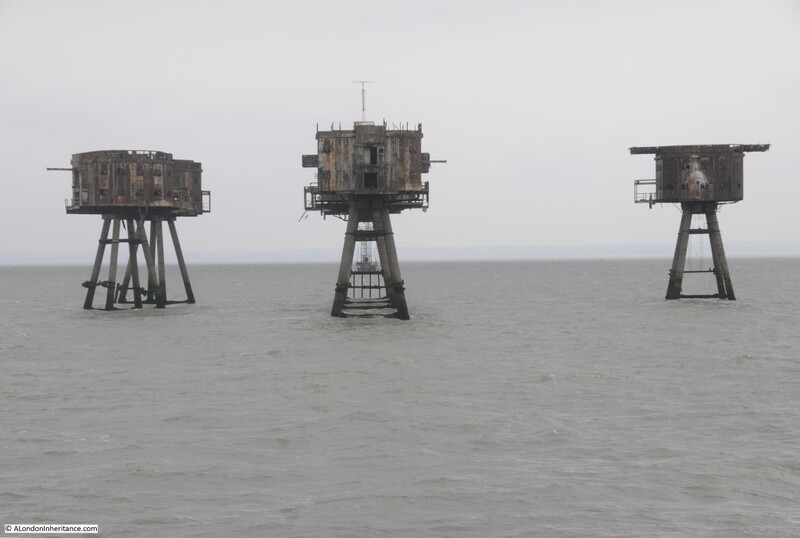 Even at this distance, connections with London can still be found through the Maunsell Forts, built specifically to defend the city from attack during the last war. The Thames is a fascinating river with a long history, intimately connected with London. Now it is time to turn round and head back to London. For my final post on the Thames it will be a dramatic after dark return to the centre of the city. 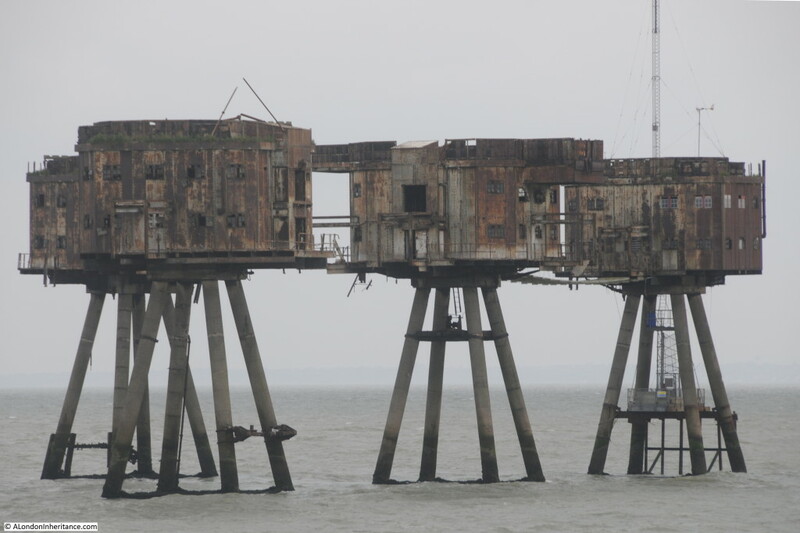 This entry was posted in The Thames and tagged Maunsell Forts, River Thames, Southend, Thames Estuary, Thames Forts on October 29, 2015 by admin. 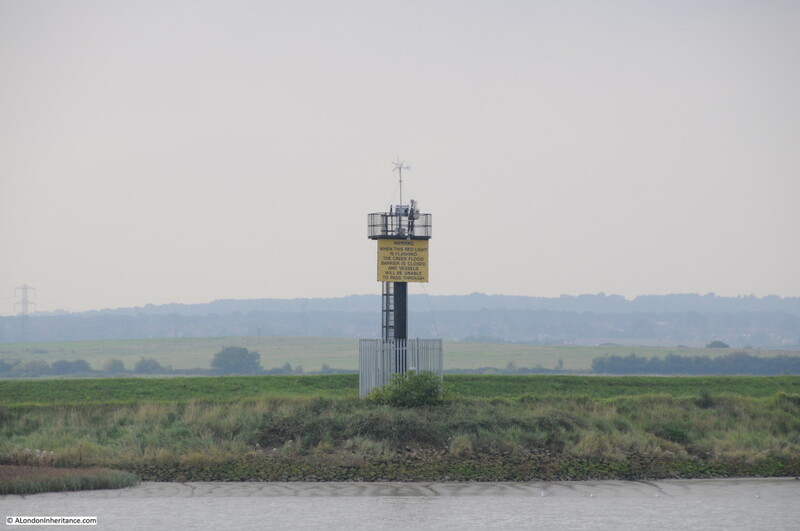 Continuing on my journey along the River Thames from the City of London to the Sea, this post covers the section from Barking Creek to Southend. The river continues to change as we get closer to the estuary. 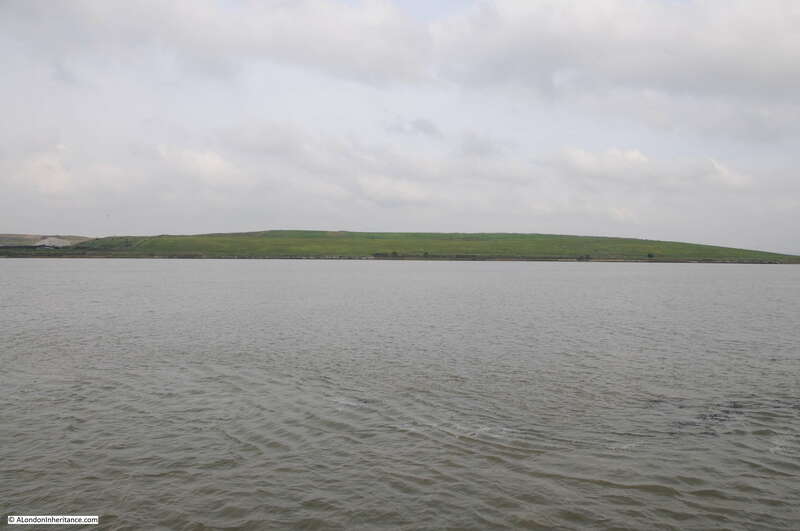 The river is wider and the land on the river bank appears lower, almost merging with the water. 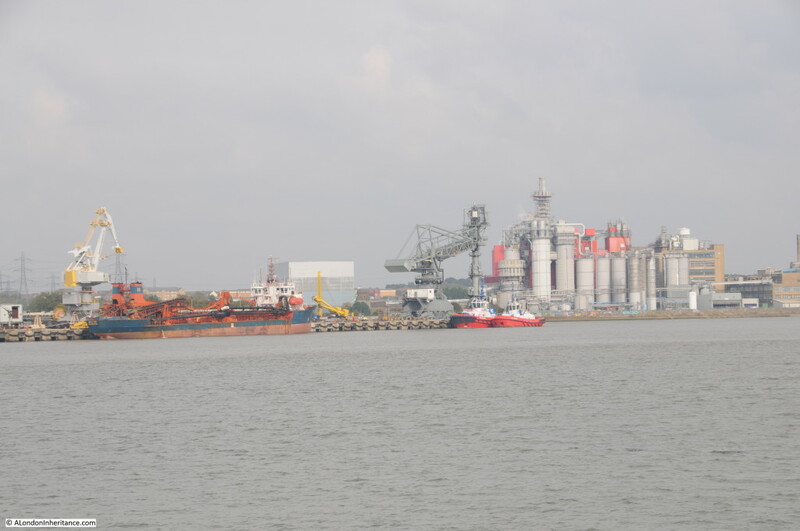 Where there is industry, transport and trade, it is now much larger, almost mirroring the increasing width of the river. Ocean going ships start to appear and the river has navigation markers for these, not the small passenger ferries that are the main river traffic closer to the city. 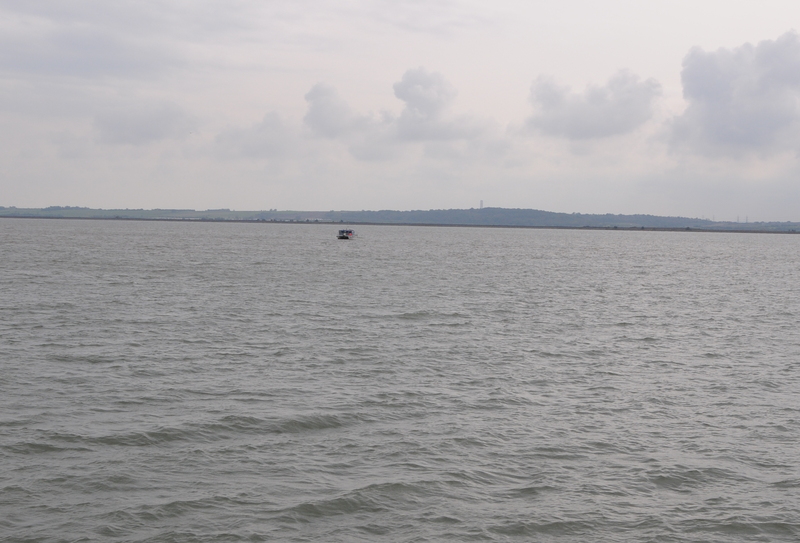 The weather also changed as we approached the estuary. The grey of the river seemed to evaporate and merge with the sky. Leaving Barking Creek, we find one of the navigation lights that help ships navigate the Thames after dark. 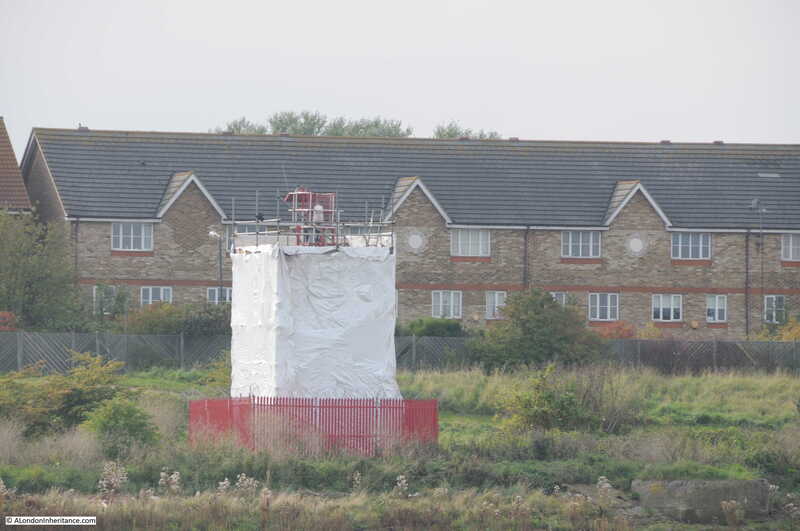 This one is at Crossness with the houses of Thamesmead behind. Undergoing some maintenance, but one of a number that line the river. On the north bank of the river, we pass the Ford plant at Dagenham. The plant is a shadow of its former self. Car production has long ceased and the plant now manufactures diesel engines. Problems with the age of the plant, terrible industrial relations during the 1970s and the strength of the Pound resulted in Ford shifting car production to a number of other European locations. A site which once employed around 40,000 workers now employs close to 3,000. There is still a dock on the river for Ford, used for shipping to transport engines to other Ford plants. How the site has changed can be seen by comparing the above with the Britain from Above photo below from 1949. In the above photo there is a very small blue Ford sign on the white band running across the centre of the building, in the past the site had the largest neon sign in Europe proudly proclaiming the Ford brand. Past Dagenham, the Thames opens up. Calm and quiet. 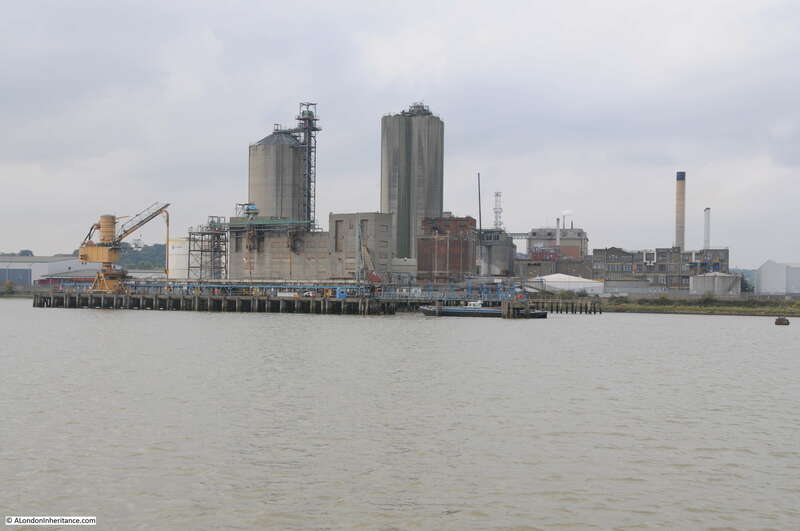 Approaching Erith, Kent on the southern bank of the river is the oil processing plant of Archer, Daniels, Midland Erith Ltd. This is oil from rapeseed, linseed and sunflowers rather than oil extracted from below ground. The plant processes 1 million tonnes of rapeseed a year to produce 385,000 tonnes of refined oil for use as food ingredients and biofuels. 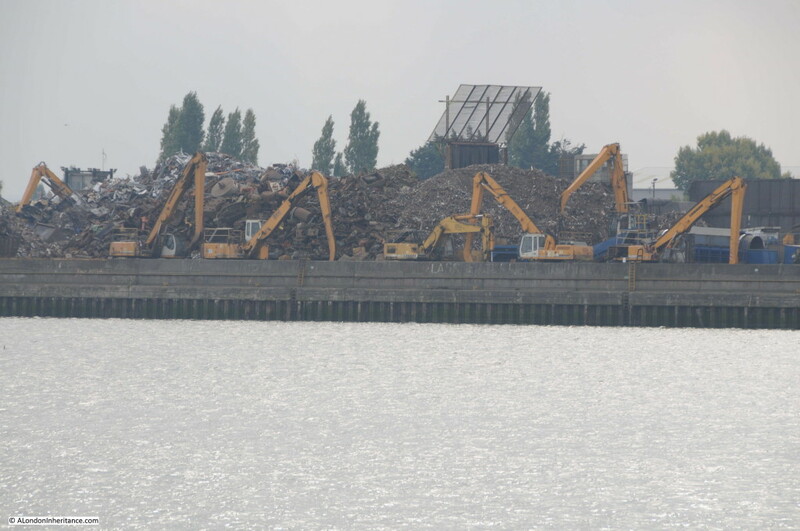 One common feature of the river bank are the scrapyards and excavators. I lost count of how many excavators there were along the length of the river. A break in the flat land bordering the Thames is not a natural feature, but a landfill site covering part of Rainham Marshes. Fortunately landfill does not occupy the majority of the old marshes and much has been preserved and now form an RSPB reserve on the Thames. Passing Rainham and the Queen Elizabeth II bridge comes into view. Opened in 1991, the bridge provides additional capacity to the two tunnels under the Thames at the same location. Traffic crossing the river at this point has grown considerably and is the only river crossing east of the Woolwich Ferry and the only bridge east of Tower Bridge. The first tunnel was opened in 1963, long before the M25 and provided a crossing under the river between Purfleet on the north bank and Dartford on the south. The second tunnel was opened in 1980, however traffic continued to grow and rather than add a third tunnel, the most cost effective method for a large volume of traffic was the bridge. 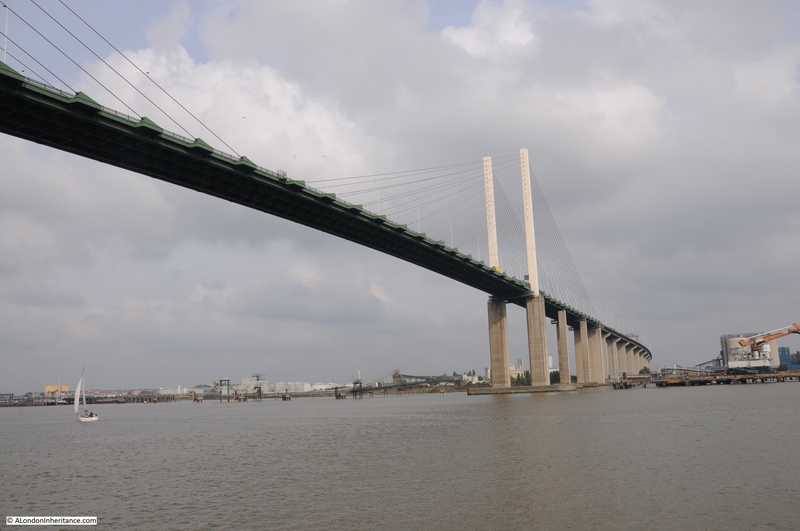 The tunnels and the bridge now make up the river crossing between the M25 on the north and south banks of the Thames. In the above photo, there is a power station on the right. 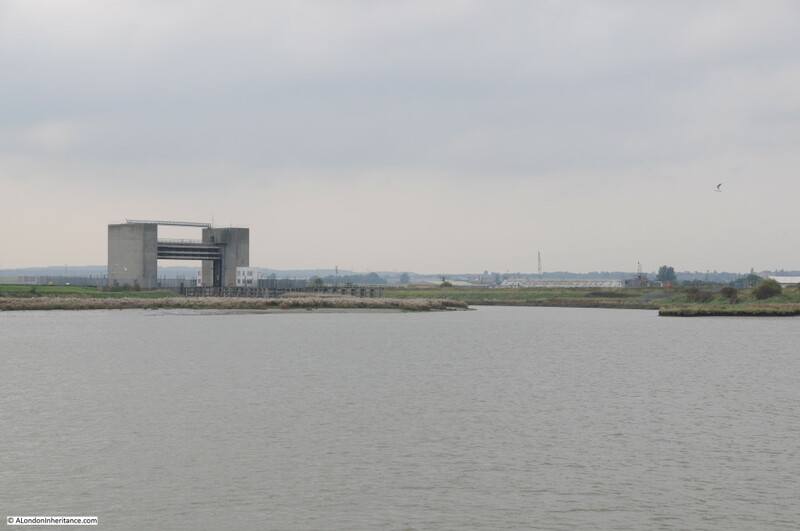 This is the Littlebrook Power Station, an oil fired station and the fourth to operate on the site since 1939. 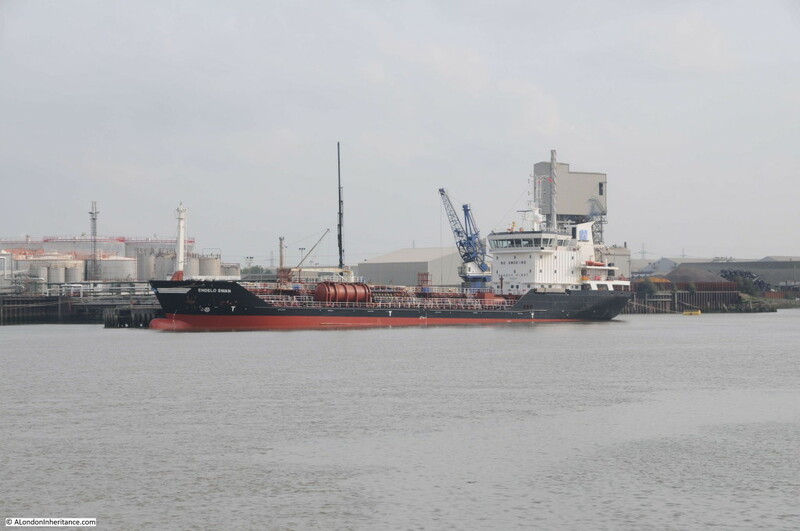 Proximity to the Thames allowed the fuel to be transported by river. The station is owned by the German utility RWE and has now closed as having used up a limited number of generating hours under the EU’s Large Combustion Plant Directive that limits the life of the most polluting power plants. On the south side of the river is where the River Darent enters the Thames. As with Barking Creek, the river has its own barrier which is lowered during very high tides and storm surges to prevent flooding down river. The river rises near Westerham in Kent. The land on the south side of the river has not been developed as much as the north and long stretches of the river bank and adjacent land have changed very little over the centuries. 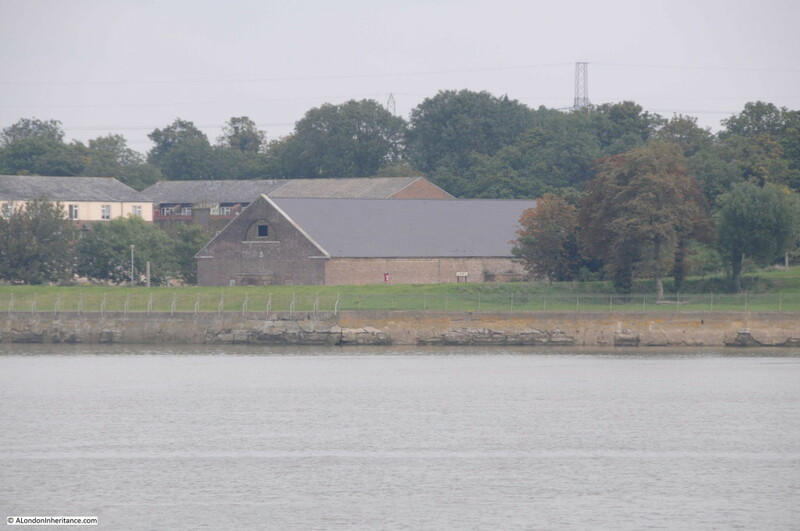 On the north bank of the river is the remaining powder magazine from the original set of five magazines that formed the Royal Magazine for Gunpowder at Purfleet. Each magazine provided storage for 10,000 barrels of gunpowder. Built between 1763 and 1765, the other four were only demolished in 1973. The site was one of the major stores of gunpowder for both the army and navy, storing powder produced at the Royal Gunpowder Factory at Waltham Abbey. Waltham Abbey is adjacent to the River Lea so it is probable that the River Lea which enters the Thames by Trinity Buoy Wharf was used to bring the gunpowder to the Thames from where it was transported along the river to Purfleet. Such was the importance of reducing the risks of sparks. wooden cranes were used inside to move the barrels. These still survive along with much of the original interior fittings. The remaining magazine is Grade 2 listed so will not suffer the fate as the other four. Now getting closer to the bridge, but the sun shows no sign of returning. Passing under the bridge it is possible to appreciate the engineering which when driving over the top it is not always possible to do. 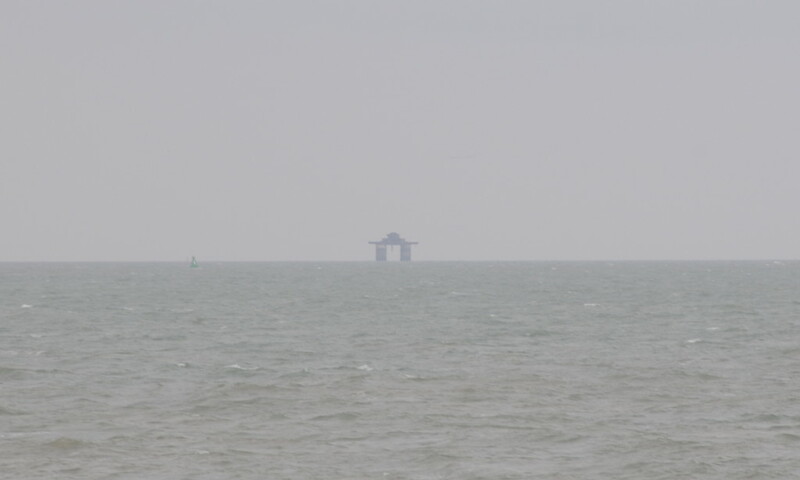 Each of the piers is designed to survive the impact of a 65,000 tonne ship travelling at 18.5km per hour. Reassuring when you next travel over the bridge! 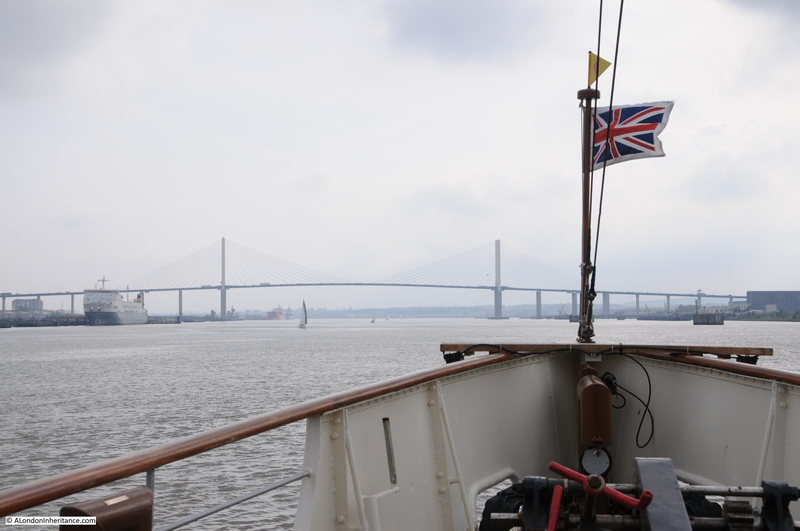 And the sun briefly makes an appearance as the Waverley sails on downriver from the bridge. 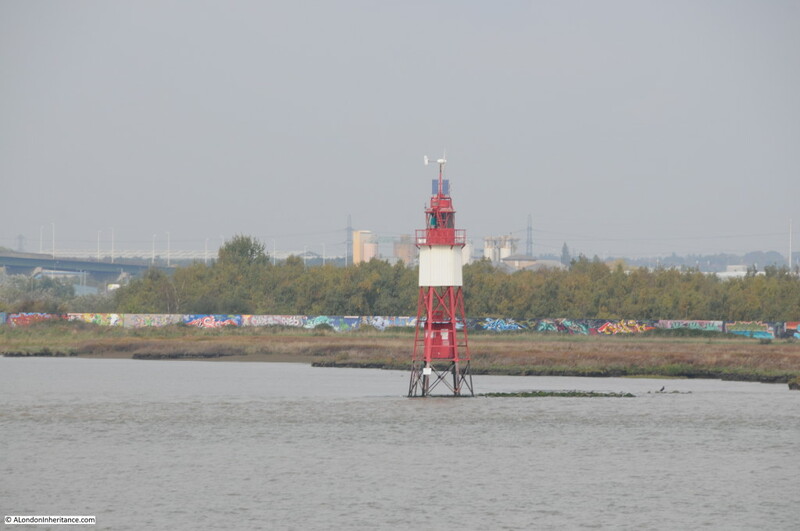 Just past the bridge, on the north bank is another of Thames lighthouses. This one the Stone Ness Lighthouse on a spit of land poking out into the Thames. 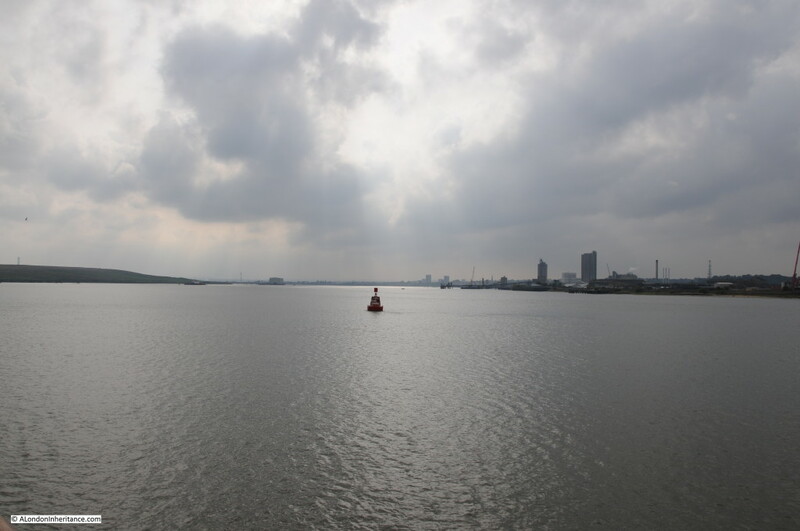 Whilst the twists and turns of the Thames are very clear during the day, at night the river is dark and although today ships have GPS navigation systems to guide them down the river, these lights would have been essential to show where the river did not continue in a straight line. Today they remain essential markers and a backup for those without accurate GPS based river mapping. 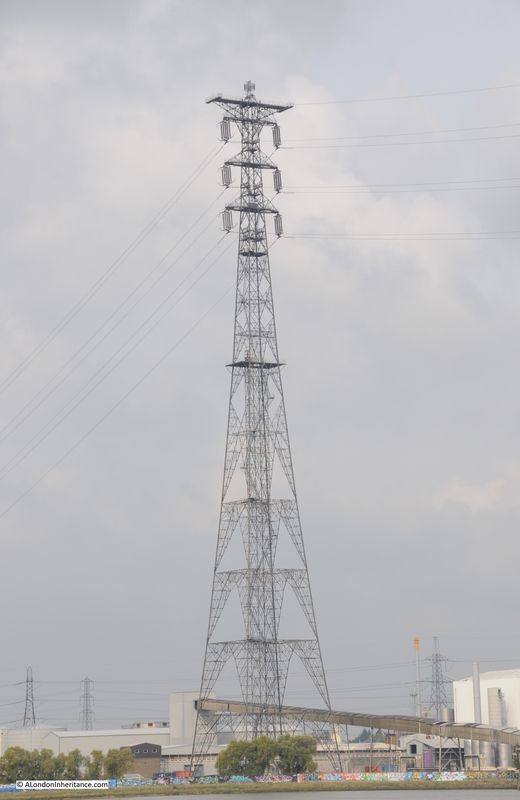 The Thames can boast that it has the tallest electrical transmission towers in the UK. These can be found supporting electrical power cables across the river between West Thurrock on the north bank and Swanscombe on the south. Built in 1965 these towers are 190m, 623ft tall. 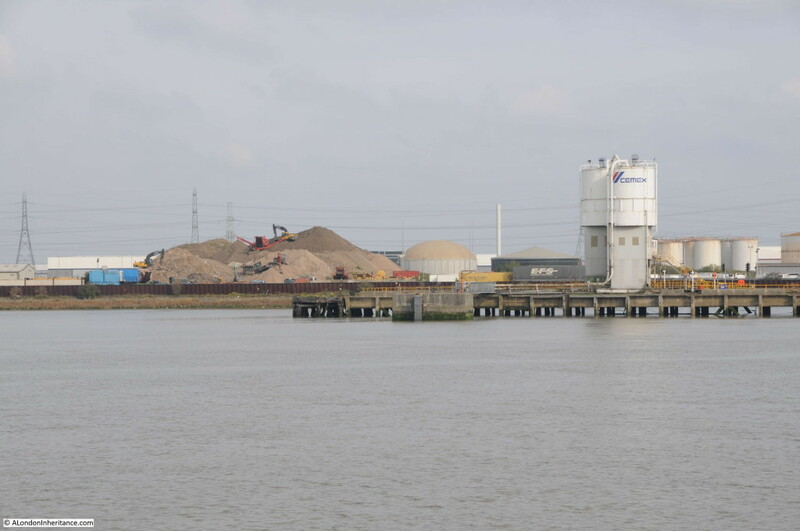 There are a number of interesting new industrial complexes along the Thames which appear to use the river for transport of raw or processed materials. 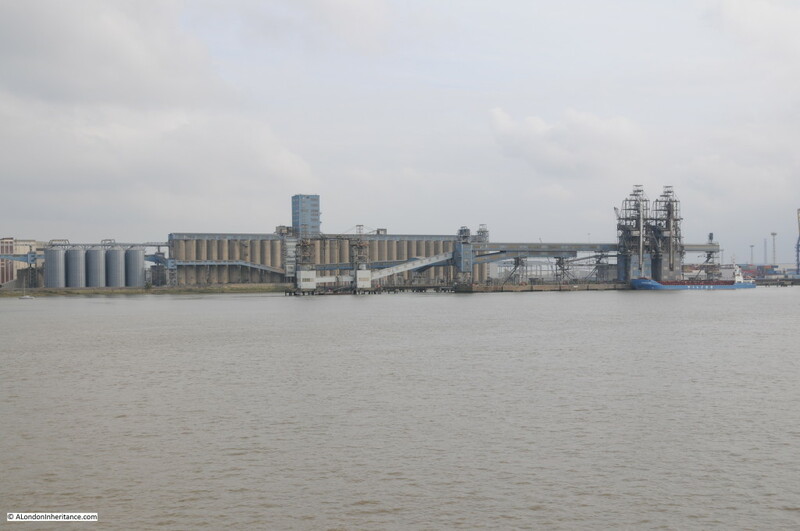 This one between West Thurrock and Tilbury, showing that along this part of the river it is still providing an essential function in supporting trade and industry. It has just moved much further downstream from London. Now at Tilbury Docks. The docks were opened in 1886 to help with the ever increasing volume of trade on London’s river and the lack of space at the central London docks. 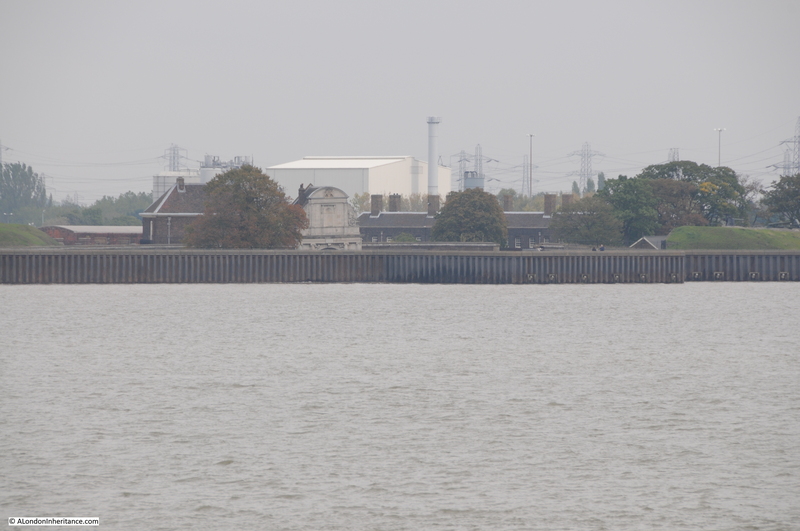 Along with the availability of land, Tilbury was an ideal location due to a railway already being in existence leading to the ferry across to Gravesend. 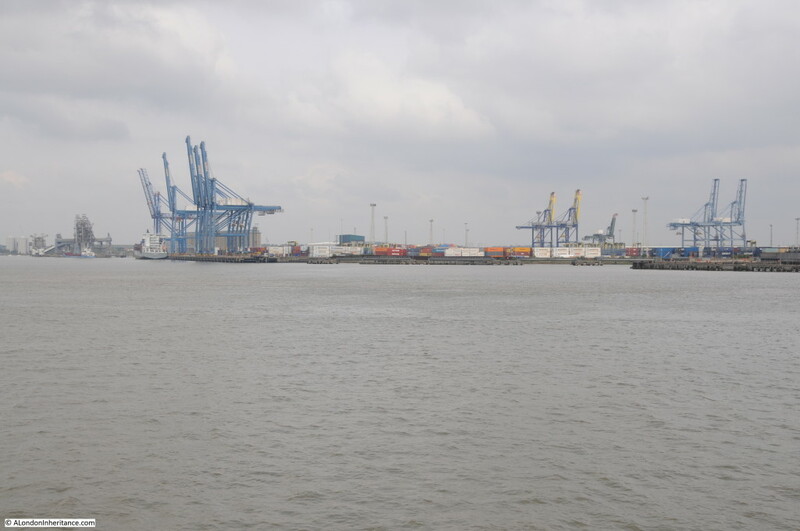 Unlike the central London docks, the availability of space, and the downstream location of Tilbury ensured that the docks could handle the conversion to containerisation and the ever increasing size of container ships. 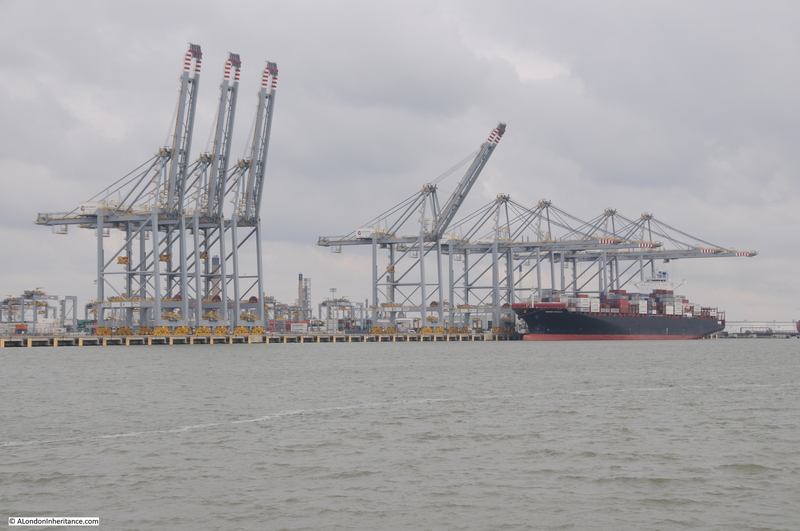 Tilbury remains a busy port, however as we shall see, there is new competition downstream. 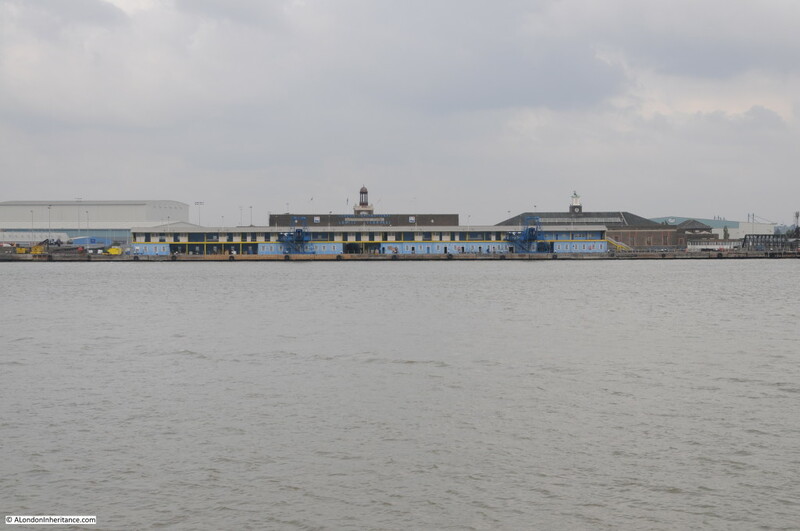 This is the London Cruise Terminal at Tilbury, the original Tilbury passenger ferry terminal. The terminal supports a number of the smaller cruise ships. In my post that covered the Thames Barrier, I commented that without the barrier the river walls on the Embankment would need to be almost up to the height of the street lamps. The height of the river and the level of the land is very noticeable along stretches of the river. The following photo is showing Tilbury Fort with the majority of the fort gate hidden below the river wall. 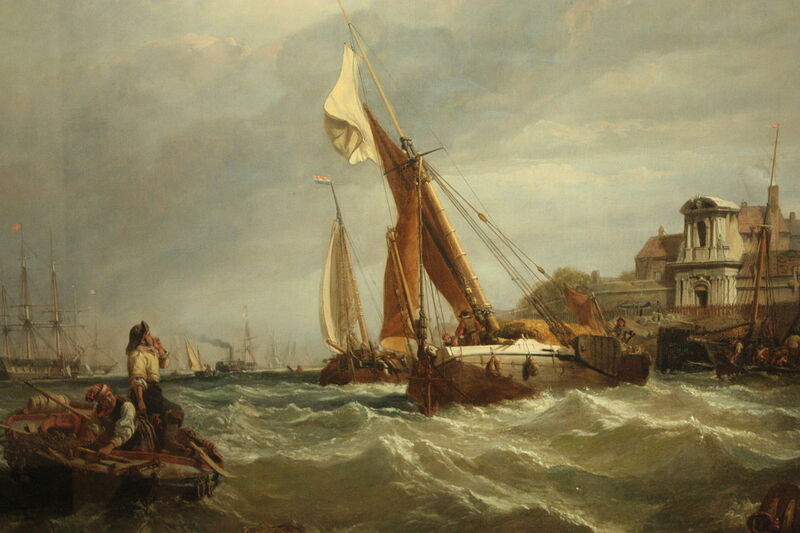 The appearance of the gate to the fort and the river in 1849 can be seen in this painting by Clarkson Frederick Stanfield titled Wind Against Tide. See also my post on the fort which can be found here. Channelling of the river, the loss of natural marsh land to absorb overflow and possible sea level rise over the centuries has resulted in the level of the Thames rising with respect to much of the surrounding land. 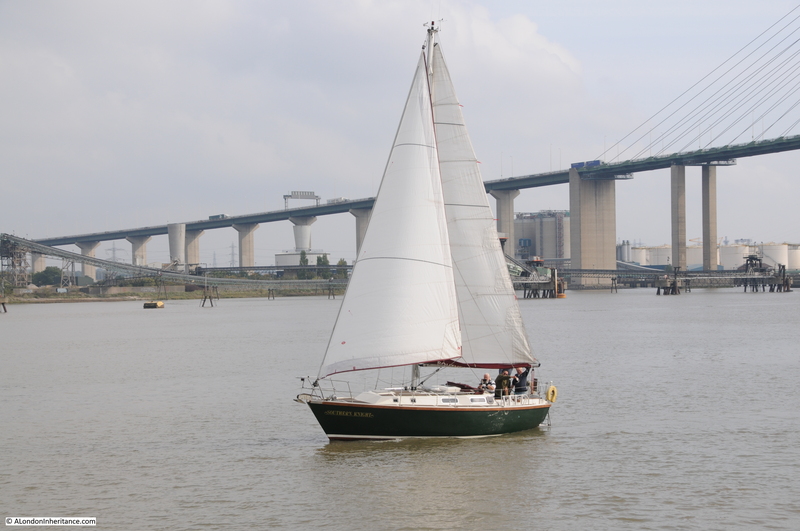 Across the river from Tilbury is Gravesend, an old town recorded in the Domesday Book of 1086. 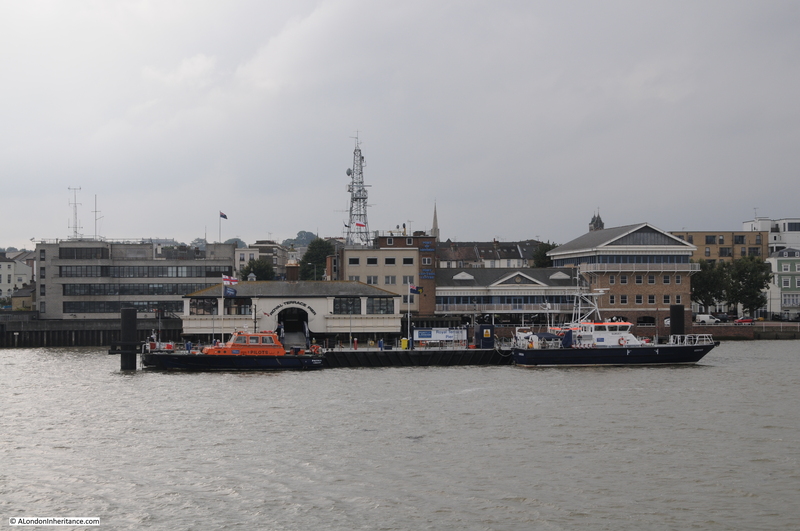 Here is the Royal Terrace Pier, built in 1844 and now an operations centre for the Port of London Authority. 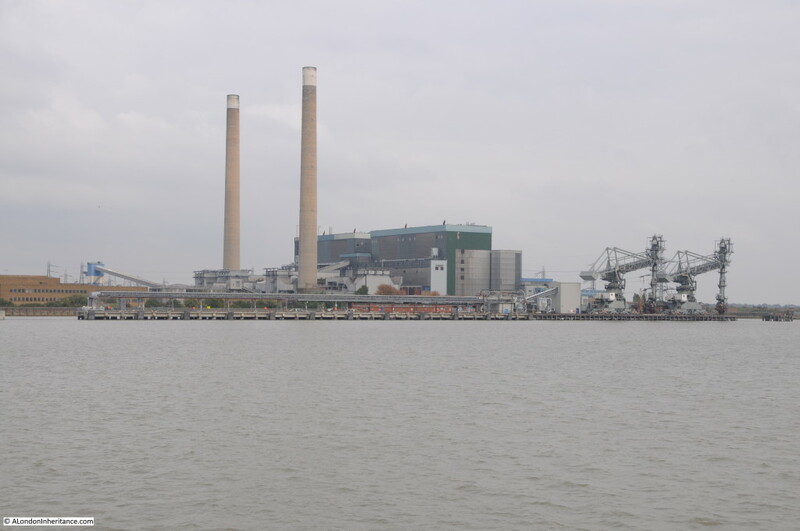 Opposite Gravesend is Tilbury Power Station, as with the Littlebrook Power Station next to the QE2 Bridge, it is also owned by RWE and closed in 2013 having used up the hours available for coal and biomass generation, raw materials which were transported along the river. I do not believe there is now an operational power station along the Thames. The river has been dredged to ensure that deep water moorings are available and the river bank built forward to provide 2.7km of quayside. 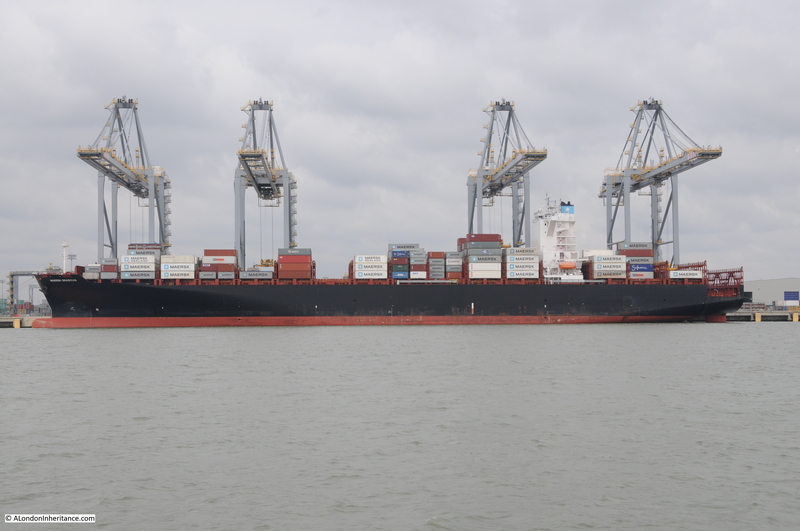 The container cranes are 453ft high and can reach across a ship laden with 25 containers across. 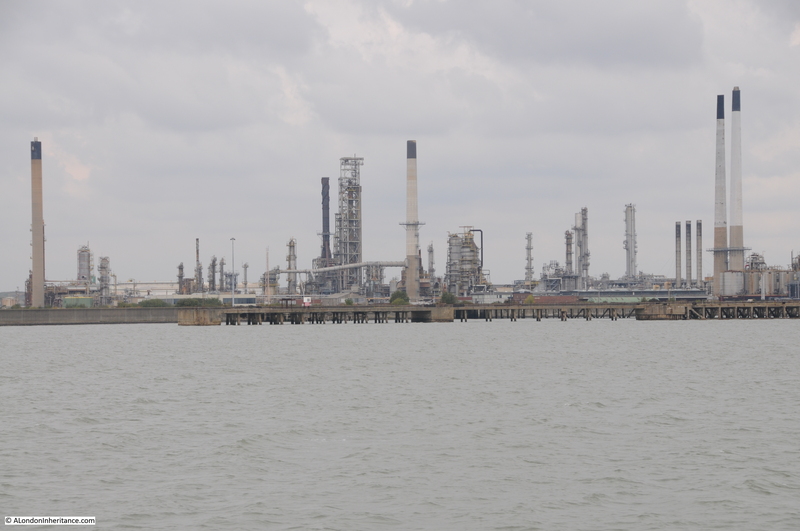 Just past the London Gateway is the Coryton Refinery, named after the village that was absorbed into the refinery complex during a period of expansion in the 1970s. The Coryton Refinery lasted longer than Shell Haven and finally closed in 2013, ending crude oil refining on the Thames. Two years later the refinery complex is still in place, awaiting whatever the future holds for the site. 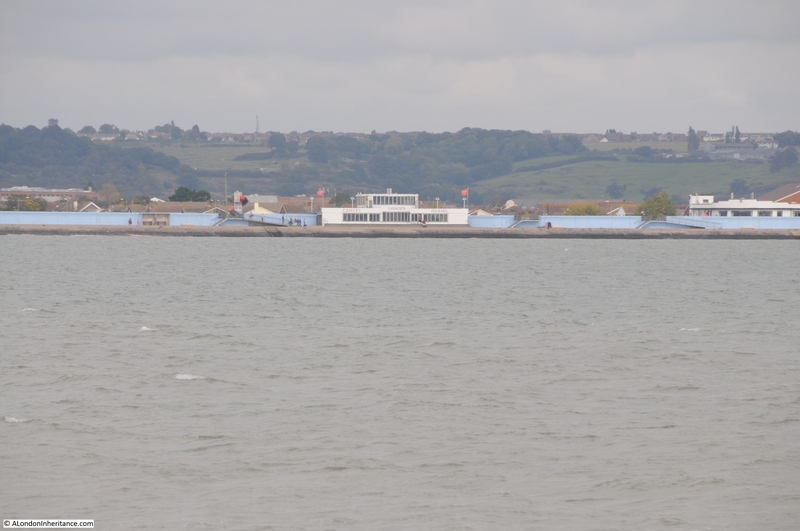 Next along is Canvey Island, The island was hit hard during the floods of 1953 which caused the deaths of 58 people. The sea wall has been significantly strengthened around the island and as can be seen in the photo below, the roof line of the houses just peer above the top of the blue sea wall. The white building in the centre of the photo is the Labworth Café. A unique modernist building made of reinforced concrete and built between 1932 and 1933. The building was almost lost during one of the river wall building programmes and the overall impact of the building has been reduced with the lower part becoming embedded in the sea defences. It has now been restored and is a Grade 2 listed building. The north Kent coastline along the Thames. The flat coast land merging with the river. One indication of how far one has travelled down the Thames is the size of ship that can be seen. This ship passing Canvey Island is an empty container ship on its way to the London Gateway. And finally, Southend Pier comes into view. The longest pier in the world at 1.34 miles. It is also Grade 2 listed. The main reason for the length of the pier was to attract pleasure boats from London. The coastal part of the Thames Estuary leading up to Southend is relatively shallow and at low tide extensive mudflats reach out from the coast. A long pier was needed to reach a water depth that did not dry out at low tide, thereby allowing boats to moor at the end of the pier and unload visiting Londoners ready to spend their hard earned money during a rare pleasure trip to Southend. Southend Pier has suffered numerous fires, has been struck by ships and has been threatened by closure, but after recent investment now seems to have a secure future. Even the trains, which were such a unique feature of the pier, continue to run. It is hard to tell at Southend where the River Thames ends and the sea begins. The Crow Stone, an obelisk set in the river edge at Westcliffe-on-Sea, just a short distance west of the pier is the traditional boundary between the river and the sea. The Crow Stone was installed in 1836 to replace an earlier stone marker from 1755. These stones marking the limits of the authority of originally the City of London and then the Port of London Authority. Unfortunately, the Crow Stone was not visible this far out in the estuary. Sailing down the Thames it is fascinating to imagine the vast number of ships and people that have travelled along the same route over the centuries. Prior to the development of flight (which given London’s long history is only relatively recently) the river was London’s gateway to the world for both people and trade. 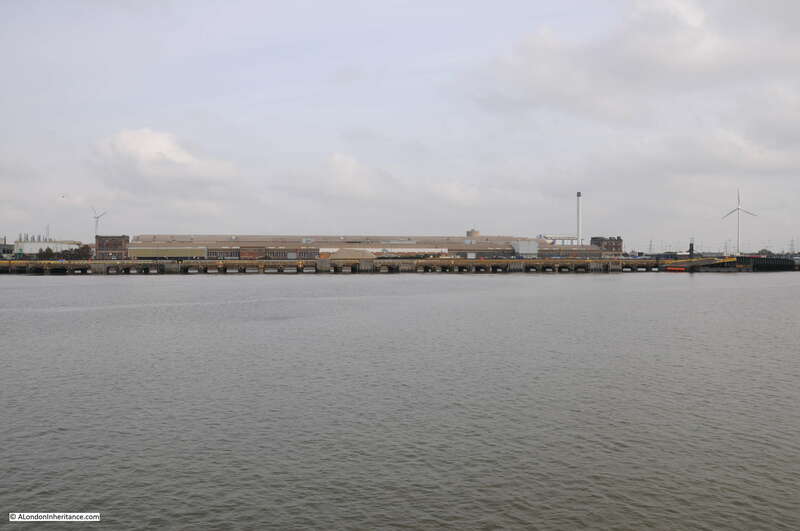 Although much reduced, it still retains this role, whether taking cruise ships to Tilbury or cargo to the docks at Tilbury and the London Gateway along with the remaining industrial sites that line the river. Although the boundary with the sea has been reached, there is more to visit, so in the next post a brief run out to the sea past Southend, before an after dark run back to Tower Pier. This entry was posted in The Thames and tagged Barking Creek, Dagenham, Erith, River Thames, Southend, Waverley on October 27, 2015 by admin.